PHILADELPHIA, PA. 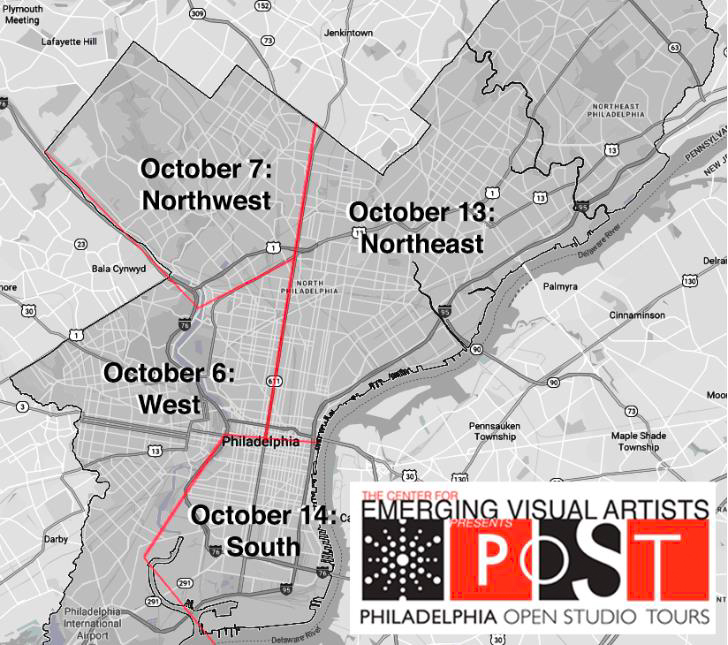 This October join us for the 19th annual Philadelphia Open Studio Tours (POST) presented by The Center for Emerging Visual Artists(CFEVA). Over four days, hundreds of artists and community partners will open their doors in over twenty neighborhoods to highlight their unique contributions to the city of Philadelphia. POST is a behind-the-scenes look at a day in the life of a visual artist as well as a community building initiative designed to strengthen bonds within the visual artist sector, fostering meaningful interaction between artists and the public, and promoting a greater awareness for the creative minds that make Philadelphia a vibrant place to live, work, and visit. The program spotlights the vitality of Philadelphia’s visual arts scene and underscores the important contributions artists make to our city’s economic and civic life. POST provides attendees with a rare glimpse at the creative process in an approachable and easy-to-navigate, self-guided tour. Activities include: studio visits, hands-on demonstrations, workshops, artist discussions, receptions, guided tours, and featured exhibitions. No other open studio event in the region provides a rich and diverse cultural experience to the public. To learn more about POST and how you can get involved as an artist, volunteer, or sponsor, visit http://www.philaopenstudio.org or contact julia@cfeva.org. Thank you to Julia Fox the content of this post. This entry was posted in Art, Art in Philadelphia, Art Opportunity, Art Spaces Philadelphia, Call for Art, Call for Artists, Center for Emerging Visual Artists, CFEVA, Experience Design, Fine Art Philadelphia, Mixed Media Art, Open Studio Tours, PA Art, Paintings, Paintings Philadelphia, Philadelphia, Philadelphia Abstract Art, Philadelphia Art, Philadelphia Art Shows, Philadelphia Art Studios, Philadelphia Artists, Philadelphia Artists, Philadelphia Open Studio Tours, Public Art, Uncategorized and tagged abstract art, Art, Art Installation, Calling all Creatives: Register for the Philadelphia Open Studio Tours 2018, DoNArTNeWs, DoNArTNeWs Philadelphia Art News Blog, drawings, fabric art, mixed media art, paintings, Philadelphia, Philadelphia Art, Philadelphia Art News, Philadelphia Art Shows, Philadelphia Artist, Philadelphia Artists, Philadelphia Fine Art, Philadelphia photography, Photography, sculpture on February 19, 2018 by admin1. PHILADELPHIA, PA – September 11, 2017. From October 7 through October 15, 2017 the Center for Emerging Visual Artists (CFEVA) will present the 18th annual Philadelphia Open Studio Tours (POST)—a behind-the-scenes look at a day in the life of a visual artist. Discover Philadelphia’s creative gems—artist studios, house galleries, maker spaces and community workshops—as hundreds of artists throw open their doors and bring the artistic process front and center in twenty Philadelphia neighborhoods. POST is a community building initiative designed to strengthen bonds within the visual artist sector, foster meaningful interaction between artists and the public, and promote a greater awareness for the creative minds that make Philadelphia a vibrant place to live, work, and visit. New this year, POST is four distinct quadrants: South, Northeast, Northwest and West. The program spotlights the vitality of each neighborhood’s visual arts scene and underscores the important contributions artists make to our city’s economy and civic life. Great for all ages, POST makes connecting with local artists easy in an approachable and easy-to-navigate, self-guided tour over two consecutive weekends. 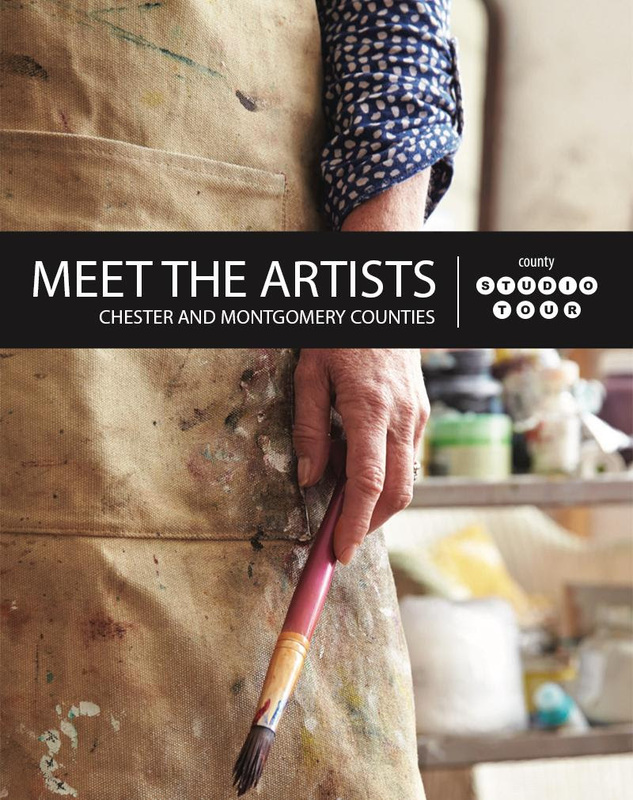 The program provides attendees with a rare glimpse at the creative process through open studio visits, hands-on demonstrations, workshops, artist discussions, receptions, guided tours, and featured exhibitions. No other open studio event in the region provides a rich and diverse cultural experience to the public, free of charge. 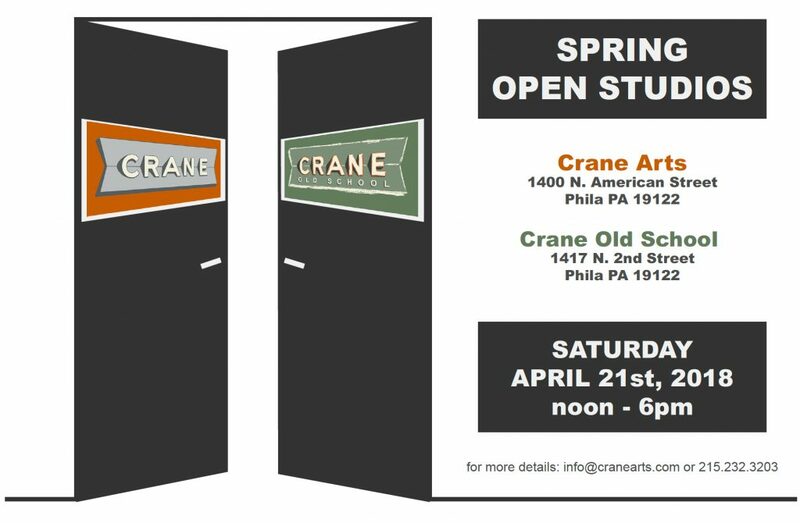 Philadelphia Open Studio Tours is made possible with generous support from Sonesta Hotel Philadelphia, myCIO Wealth Partners, LLC, Reed Smith LLP, University of Pennsylvania and 40ST Artist-in-Residence Program. Additional support is provided by Brandywine Realty Trust, Stifel, MJB Wealth Management, The William Penn Foundation, Philadelphia Cultural Fund, and the Independence Foundation. Promotional support is provided by Fireball Printing, HeavyBubble, Metro Philadelphia, ici, and Design Philadelphia. The Center for Emerging Visual Artists receives state arts funding support through a grant from the Pennsylvania Council on the Arts, a state agency funded by the Commonwealth of Pennsylvania and the National Endowment for the Arts, a federal agency. Comprehensive festival information is available at philaopenstudios.org, the best source for the most up-to-date details about participating artists, venue locations, and events. Audiences can search POST participants alphabetically by last name, geographically by neighborhood, and thematically by type of work or media. Printed Directories are available for free at all participating POST venues starting in mid-September. CFEVA and ici are proud to offer studio visitors a free POST mobile app and smartphone guide, powered by the ici platform. Information about the mobile app and smartphone guide is online at www.icihere.com, or by following the ici User Guide, available immediately after download. Featuring Elena Bouvier, Bill Brookover, and PD Packard. @HBHQ is an exhibition, workshop, and demonstration space housed at 1241 Carpenter Studios, and curated by the artist team at Heavybubble. Get in the Halloween spirit early with Da Vinci Art Alliance (DVAA)! 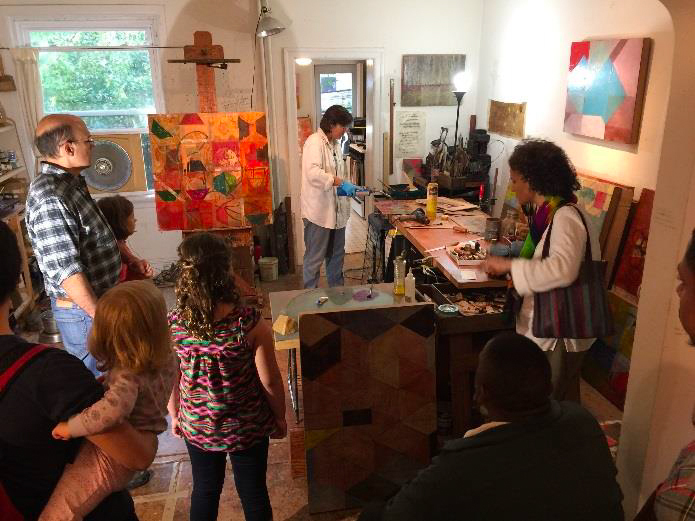 Enjoy an afternoon of art-making, cider-sipping and glass pumpkin patch picking all while supporting DVAA, Tyler School of Art, and CFEVA’s Philadelphia Open Studio Tours. Featuring Periphery”, a group of multi-disciplinary artists whose production and conceptual queries are articulated on the outer boundaries of their material communities. POST Artist Katherine Fraser in her studio at 319 N. 11th St. Featuring installations by Talia Greene, Lewis Colburn, Myung Gyun You, and Aislinn Pentcost-Farren with Camp Little Hope. 2017-18 Resident, Karina Puente, will be working on site. Old City Fest is a celebration of art and design, fashion and food, creativity and culture on the streets of America’s most historic square mile. A partnership between The Schuylkill Center for Environmental Education (SCEE) and CFEVA, LandLab Residents will spend the next year engaging with SCEE’s property, conducting research, and developing creative installations that intervene with the land. Visit them during POST f to learn more about ways in which they will be working to remediate the ecological issues found in the 340-acre wooded property. Awbury Arboretum is a historic landscape in Northwest Philadelphia that is free and open to the public 365 days a year. The parlors of the beautiful Francis Cope House will feature 2017 POST Northwest artists. Featuring works by: Henry Bermudez, Andrea Krupp, Robert Miller, and Dolores Poacelli. A year-long studio program catering to West Philadelphia. Residents include Santiago Galeas, Khiry W. Worrell, Serena Muthi Reed, Josh Graupera, and Margaret Kearney. Featuring new photographic pop-up books by Colette Fu that “speak, mediate, express, delight and inform.” Constructing pop-ups allows Fu to combine intuitive design and technical acuity with her love of travel and curiosity about the world around her. Thank you to CFEVA for the content of this POST. This entry was posted in Art, Art Galleries, Art History, Art in Philadelphia, Art Tours, CFEVA, Collage, Collectibles, Crafts, Da Vinci Art Alliance, Drawings, DVAA, Fine Art Philadelphia, Mixed Media Art, Open Studio Tours, Paintings, Paintings Philadelphia, Philadelphia, Philadelphia Abstract Art, Philadelphia Art, Philadelphia Art Galleries, Philadelphia Art Shows, Philadelphia Art Studios, Philadelphia Artists, Philadelphia Open Studio Tours, Philadelphia Photographers, Philadelphia Pop Art, Philadelphia Sculpture, Photography Philadelphia, Pottery, Prints, Public Art, Sculpture, Social Practice, Uncategorized, Works on Paper and tagged 40ST Artist-in-Residence, abstract art, alia Greene, and Aislinn Pentcost-Farren with Camp Little Hope, antiago Galeas, Art, Art Installation, Awbury Arboretum, Center for Emerging Visual Artists, CFEVA, Da Vinci Art Alliance, DoNArTNeWs Philadelphia Art News Blog, drawings, For Our Ancestors, Glen Foerd on the Delaware, Josh Graupera, Katherine Fraser, Khiry W. Worrell, Lewis Colburn, Margaret Kearney, mixed media art, Myung Gyun You, Old City Arts District, Old City Fest, Over the Rainbow, paintings, Philadelphia, Philadelphia Art, Philadelphia Art Gallery, Philadelphia Art News, Philadelphia Art Shows, Philadelphia Artist, Philadelphia Artists, Philadelphia Fine Art, Philadelphia photography, Photography, POST @HBHQ, sculpture, Serena Muthi Reed, The Schuylkill Center for Environmental Education, THIS OCTOBER: Explore. Discover. Connect. Philadelphia Open Studio Tours on September 12, 2017 by admin1. The studios will be open from 11:00am – 5:00pm daily at 1448 Street Road, New Hope, Pa.
Kirby Fredendall is a formally trained artist who attended Duke University. Her new body of work depicts recent landscapes inspired by Friend’s Lake in the Adirondack Mountains of upstate New York. These images represent a dramatic departure for Fredendall who has been successfully showing her abstractions for many years. For Kirby Fredendall, “The visual drama of the lake is never the same. Multiple conditions of light created by the time of day and the weather create textures in the water, patterns in the clouds, and juxtapositions of color that vibrate with one another to form a compelling visual and highly personal experience. Fredendall additionally “enjoys the manipulation of paint and how that process in itself contributes to the life and form of the final image.” These images represent her interest in the beautiful and ever changing landscape of upstate New York. Raised in Carversville, PA, Kirby Fredendall has taught painting, drawing, and design for 23 years at Solebury School, and now also teaches from her home, Glendale Art Studio. Alex Damevski is a Yugoslavian photographer who immigrated to the United States. He attended Syracuse University and later attended Temple University for his graduate work. Memories around photography as a child in a new country inspired Alex Damevski deeply and the affinity for photography has never left him – from pressing the shutter, to developing the film, to his current use of digital photography. This entry was posted in Art, Art Galleries, Art in Philadelphia, Fine Art Philadelphia, New Hope, Open Studio Tours, Paintings, Paintings Philadelphia, Philadelphia, Philadelphia Art, Philadelphia Art Galleries, Philadelphia Artists, Philadelphia Artists, Photography Philadelphia, Uncategorized, Works on Paper, Writing and tagged Alex Damevski, Art, DoNArTNeWs Philadelphia Art News Blog, drawings, Glendale Art Studio, Kirby Fredendall, mixed media art, New Hope, New Work, Open Studio, Open Studio Tour, Painter and Alex Damevski, paintings, Philadelphia, Philadelphia Art, Philadelphia Art Gallery, Philadelphia Art News, Philadelphia Art Shows, Philadelphia Artist, Philadelphia Artists, Philadelphia Fine Art, Philadelphia photography, photographer, Photography, Solebury School, Yugoslavian photographer on October 26, 2016 by admin1.